The International Space Station is not as squeaky clean as you might think, a new study finds. 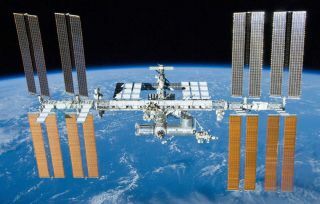 The microbes living on the International Space Station (ISS) may be similar to the bacteria found in homes on Earth, a new study shows. David Coil, study author and a microbiologist at the University of California (UC), Davis, said in a statement that humans are "completely surrounded by mostly harmless microbes on Earth, and we see a broadly similar microbial community on the ISS. So [the station] is probably no more or less gross than your living room." The swabs were collected from 15 locations inside the space station. The station's microbiome (the population of microbes living there) would not have originated in space, but are directly from the astronauts' bodies and anything else sent to the space station from Earth, because the orbiting lab is completely enclosed, the researchers said in the statement. The study also revealed that the space station's microbiome is very diverse, according to the statement, which indicates that the microbes are healthy. Microbe swabs from the International Space Station, shown here after returning to Earth in February 2015. The swabs were collected by project MERCCURI (Microbial Ecology Research Combining Citizen and University Researchers). "The microbiome on the surfaces on the ISS looks very much like the surfaces of its inhabitants, which is not surprising, given that they are the primary source," Jenna Lang, lead author of the study and a former postdoctoral scholar at UC Davis, said. "We were also pleased to see … that the diversity was fairly high, indicating that it did not look like a 'sick' microbial community." Project MERCCURI involves the work of researchers from UC Davis and other organizations like Science Cheerleader, a group of current and former NFL and NBA cheerleaders pursuing careers in science and technology. Project MERCCURI team members at Cape Canaveral just before the microbe swabs launched in April 2014. The swabs collected from the space station were compared to data from previous, Earth-based studies, including the Wild Life of Our Homes citizen science project, which examined the microbial diversity found within homes. Researchers also compared the samples from space to surveys of human body sites from the Human Microbiome Project, according to the study. "Studying the microbial diversity on the ISS is not only of relevance to space exploration but also serves as an important comparison to buildings on Earth, because the ISS has many novel features such as [a] limited influx of microbes," said study author Jonathan Eisen, a professor of medical microbiology and immunology at UC Davis. The findings were published today (Dec. 5) in the open-access journal PeerJ.